Using this wonderful guide made by Digi, I configured a simple relay network of three XBee Pro 538 modules. This used their XTCU configuration software so program the radios to be part of the same network. The transmitter and receiver were first placed out of range, then the relay was placed in a spot that provided communication between them. This test used broadcast messages, so my next work is to design some simple Arduino code to send unicast messages that are addressed only for the receiver, and get relayed by the relay node. The XBee API makes it simple to send messages to any node in a network as there is no master/slave designations. This will allow the relay node to also send messages to the transmitter or receiver, such as telemetry or connection quality. I conducted a test outdoors with and without the relay. 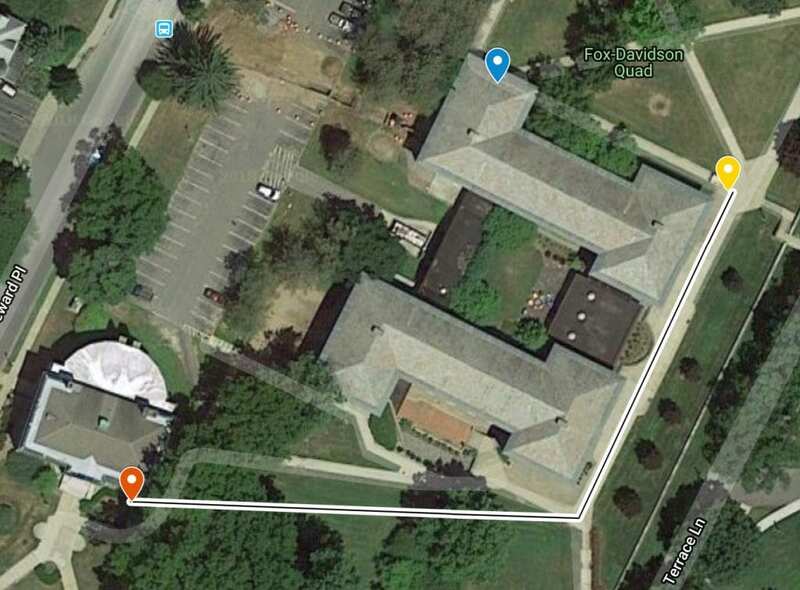 The transmitter (ground station) was placed under the overhang (blue marker) at the entrance to Davidson North. The overhang I believe should restrict it from transmitting over the building and restrict the reflections off of Fox that could bounce over the building. Signal was lost immediately after turning the corner of the building (red marker). I placed the relay at the corner closest to the ground station (yellow marker). Signal was lost significantly further than without the relay. There were spotty points on the way, but it remained relatively strong until it cut out completely right by Webster. The test confirmed that the relay does fulfill its base function. I would like to conduct a test somewhere with less places for reflection. The terrace wall probably made this test not as accurate as it could have been. As a first order of business, I assembled the basic relay as the last part arrived right before the end of last term. The PPM output of the FrSky X4R was input into the DJT module’s PPM in. Using a forum post, I determined the pinout of the module. The DJT module doesn’t have listed power specs, but I took an educated guess and powered it with 5v, which seemed to do the trick. I tested the system using a servo plugged into the “end” receiver and it worked as expected! The data is certainly noisy, but with a reasonable moving average it is discernible which antenna is receiving a stronger signal over the other. It is much easier to tell with a larger angle between the antennas which is to be expected. 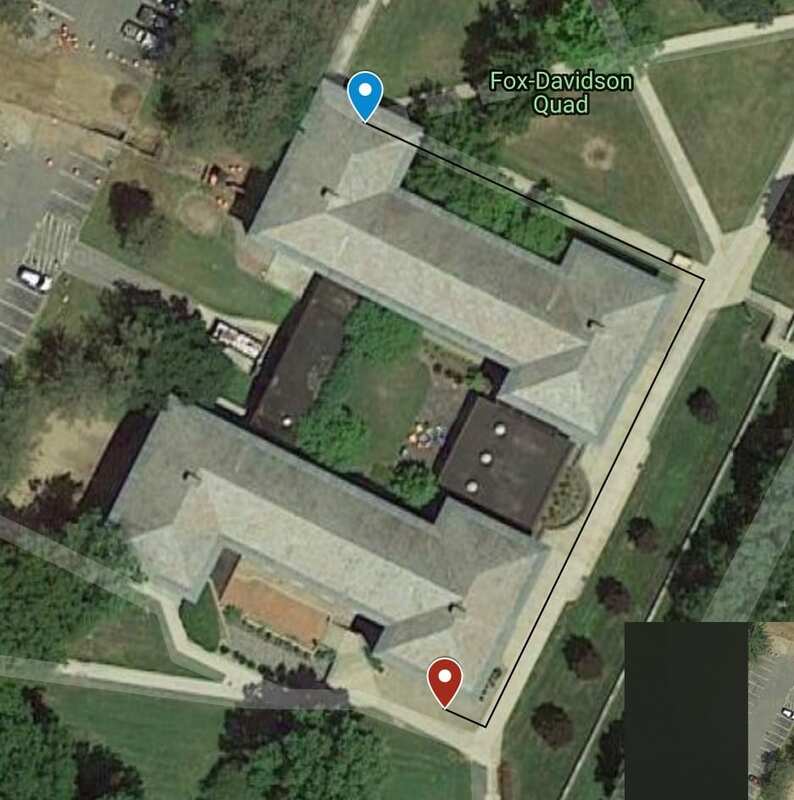 I conduced a simple indoor test by leaving the “UAV” transmitter in my room, walking down the hall into a friends room where I could no longer receive signal directly from the “UAV,” then set up the relay right outside his room in the hallway and switched my “ground station” receiver over to receive from the relay. The signal was relayed perfectly. I conducted some basic RSSI testing at Maalwyk park. Managed to get two useful positions before the weather didn’t cooperate anymore. I started with the far right corner, and it promptly started to rain so I only managed to get the far right point. Both points are ~35 degrees off the centerline and ~800 feet away from the receiver. 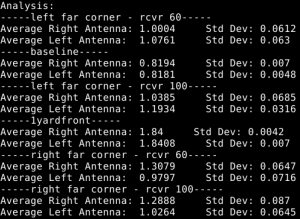 The data, taken with a grain of salt as I don’t have enough points to make a real conclusion, shows that in general there is a detectable difference between having a transmitter on the different angles from the receiver, and the difference is larger with a larger angle between the antennas. This isn’t really a useful conclusion, but the test itself proves that I can collect useful data and it can be done fairly quickly. Everything but the FrSky DJT module has arrived. I can now test the video relay in its entirety as well as start developing on the XBee radios. I have submitted a parts list to Lisa as of Tuesday night. Most of the parts have short shipping time so hopefully by next week I can start to assemble and run actual tests of the first level of relay using just off-the-shelf components. I now have a complete setup to begin running tests of RSSI differences between two helical antennas. I attempted to run a proof-of-concept indoors (yes I know you told me specifically not to do that, but it was raining outside and I procrastinated. So I guess I have no real excuse…). The values were noisy, but it was easy to see that the RSSI output reacted to which antenna the transmitter was near. I started off by using “pit mode,” a feature that greatly minimizes the tx power of the transmitter. There is no official power level other than “2-3 meters” so regardless it is very small. Moving up to 25mW, I could still see a reaction when moving parallel to the two antennas which were angled about 30° from each other. I tested also with 200mW. I haven’t included any data because it was difficult to interpret live and I saw no way that I could get usable info from it because I was inside, and it was erratic enough to not be worth the effort. Proper testing will be done this week outside on a field. I will carry my phone with me when moving the transmitter around to record a GPS track so I can easily correlate (or not correlate) RSSI data with position. Tinfoil? The internet says it works. They are always right. A simple 3D printed enclosure lined with tinfoil on the inside would make for a cheap and easy shielding cover. Aero has quite a few XBee radios that appear to be close to the same as the ones I am purchasing. If the order takes longer than expected I can use these as stand-ins but I doubt they will take longer than it will take for me to finish testing other components.